Chardonnay Day is Thursday, May 21st. 4/17–World Malbec Day (I missed it). 5/9–World Moscato Day (um, missed it too). 5/15–International Sauvignon Blanc Day (not sure what is the relative distinction between “World” and “International” but I have no doubt that someone considers it monumental–and yes, I missed it). 8/11/15–International Albariño Day (I love Albariño, but does it deserve a whole day?). 8/27/15–International Cabernet Day (And with that, “International” takes the lead). For the most part, I don’t “celebrate” any of these days. Why? Many of you probably think that I am incredibly snobby and that it is somehow beneath me to be beholden to such elementary marketing intended for the bourgeoisie. Yup, these “Days” just simply slip my mind most of the time, but there are two exceptions. One I am sure you can guess: Champagne Day is in the third week of October, and I make a big deal about it (actually, I just grab a better bottle of champagne than normal–don’t tell anyone, but we currently have just under 200 bottles of champagne in the cellar–I kind of dig the stuff). The other is Chardonnay Day, which is coming up this Thursday, May 21st. No lie, those are the two that I don’t forget and always observe. As long as I am typing out a few truths, I might as well add that I am much more of a white wine drinker than red. Don’t get me wrong, I love red wine, but given the choice, with all things being equal, I will grab a white over a red just about every time. In fact, I am not really sure what I would choose for my last meal: it would be either a bottle of Krug Clos d’Ambonnay (champagne), or a Domaine de la Romanée Conti Montrachet (not just the best Chardonnay, but the best white wine in the world). Honestly, I do not know which way I would roll on that–given my proclivity for unabashed boldness, I would likely try to score both (“go bold or go home” as I always say). Both cost in the neighborhood of $2000. A bottle. Instead, I have a few others to recommend for Chardonnay Day this Thursday. 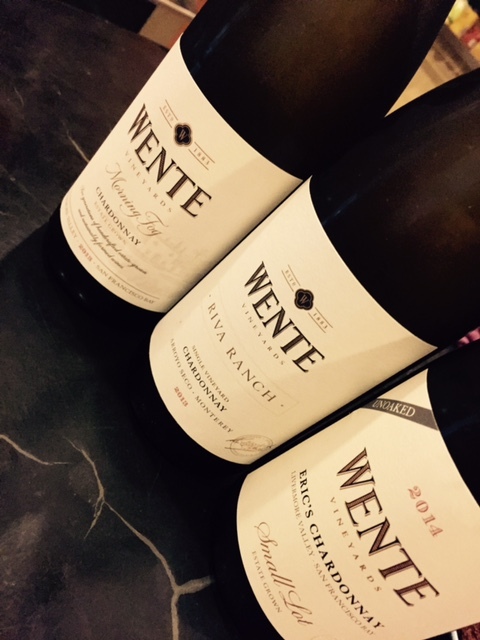 They all come from California’s First Family of Chardonnay, Wente Vineyards. It was Ernest Wente who brought back the first cuttings of Chardonnay to the Golden State from France in the early 1900’s. Eventually, it was the Wente Family that made the first varietally-labeled Chardonnay in the U.S. (1936) and now, the famous Wente clone (cuttings from some of the first Chardonnay plants on the continent) have populated vineyards around the world. 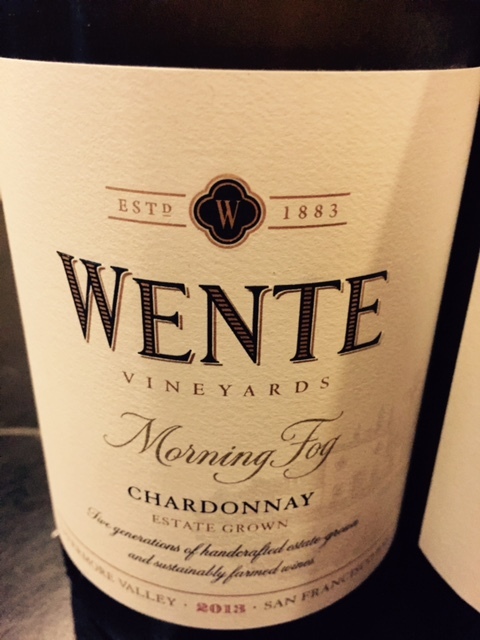 2013 Wente Vineyards Morning Fog Chardonnay Estate Grown: Retail $15. 50% fermented in neutral oak, 50% in stainless steel. $15? Really? A wonderful nose of lemon and green apple. On the palate, actually very nice. A hint of oak, good fruit and balance. Big surprise here, I did not think a $15 Chard could be this good–that is why, while relevant, price is not the be-all end-all. Very Good, perhaps more. 88-90 Points. 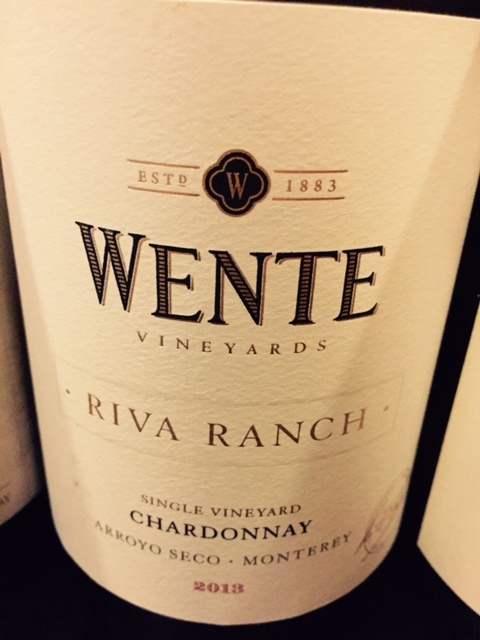 2013 Wente Vineyards Riva Ranch Single Vineyard Chardonnay: Retail $22. Mostly fermented in new and second use French and American oak. At $22 this is another bargain. Cleaner with less oak influence than the Morning Fog (although this one saw more oak, curiously), this screams out for oysters, calamari, or even a nice crab cake. Great acidity and citrus fruit with a solid balance throughout. I liked the Morning Fog slightly better, honestly, but at $22, this is a solid option. Very Good. 87-89 Points. 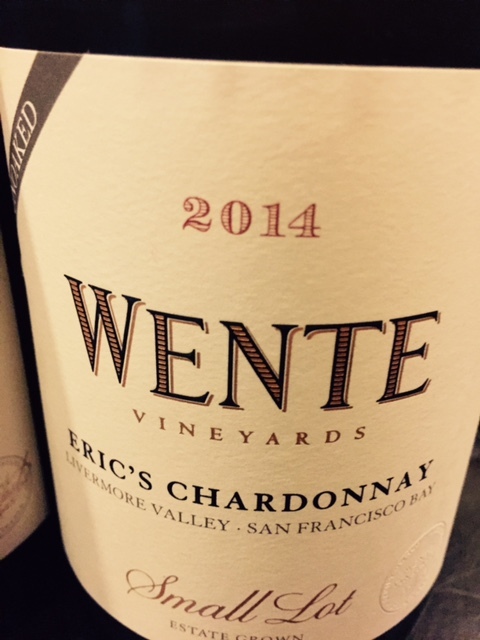 2014 Wente Vineyards Eric’s Chardonnay Unoaked Small Lot: Retail $25. Four months in stainless steel. Bright and vibrant on the nose. Initially, this was a bit non-descript–there was just not much there. But it was too cold. As I watched an episode of Anthony Bourdain’s latest shock-tertainment, I let the wine warm up. Big difference. Huge difference. A well-balanced, un-oaked style with an intense finish. This is really fabulous, particularly for the ABC crowd. If you can find a bottle of this, I would buy it (and remember to not serve it too cold). Outstanding. 90-92 Points. This entry was posted in Chardonnay, Wine and tagged Chardonnay, Wente Vineyards. Bookmark the permalink. I’ll be opening these three bottles on Thursday, which is unusual for me. Generally I avoid the “special days” and go against the grain. Nothing like opening a syrah when everyone else is opening a cab…and vice versa. Oh good! I look forward to reading what you have to say about them–I was impressed! Thursday is my 10 year wedding anniversary, and I already have a magnum of Ruinart Blanc de Blancs Champagne lined up. It will be even more apt now! Interestingly, (at least to me) there was also a Sauvignon Blanc Day on April 24th. That day got a bit more play on social media than this past one. As for Thursday, it being Chardonnay we may have to have our arms twisted to participate. I did not know there was a Champagne Day, (but as you said, everything has a day so I should have known) I ‘ll have to look into that one, love an another excuse to open the bubbles. I think the relative popularity of the given “Day” is driven by the energy provided by the bigger producers of PR firms. The whole concept smacks me as a Hallmark-like created “holiday” to sell greeting cards…. I like the way you think my friend! You inspire me to drink more Champagne! I will take any excuse to drink wine. It’s also my grad school graduation that day. I say, time to celebrate with some Chardonnay. Oh, congratulations! 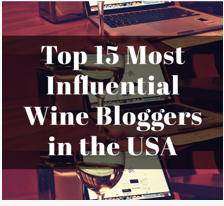 A fantastic reason to pop some corks! That does not qualify as an “excuse”–celebrate away! Don’t forget Beaujolais Nouveau Day – Nov 19, 2015 !! Nice call Mike! How could I forget? Perhaps the “Day” that started all this madness! Duuuude! 200 bottles of Champers! You’re my hero. I’ll look for something interesting for Chard Day…in the meantime and in between time (as the saying goes) I’m going to a Krug tasting with Olivier Krug tonight! Wish you were here! How was the Krug tasting??? OK, dumb question. Never mind….